Is your organization too immature to use static source code analysis? Do your developers find static source code analysis to be too time consuming? Are you catching all the defects in your software? Can you continue to afford to keep releasing flaw ridden source code? Static source code analysis provides the information you need to address these concerns and to obtain better results. It is a software testing method for detecting defects in a non-compiled application that detects code vulnerabilities traditional testing cannot. Organizations implementing new source code or updating applications in a complex, multi-tier infrastructure require an automated static source code analysis capability that reduces time and improves detection accuracy. Automated solutions eliminate the need to manually read each line of a codebase and supply repeatable measurements for benchmarking purposes as applications constantly change to meet end user or business requirements. Automated solutions utilizing static source code analysis algorithms deliver an accurate, repeatable assessment that can be used by organizations to identify critical vulnerabilities, fix quality or security defects, and provide a continuous improvement measurement. If manual static source code analysis is taking up too much time or proving to be ineffective, an automated solution delivers enhanced results - at a reduced cost. Do You Need an Enterprise-Class Static Source Code Analysis Solution? While a number of open source and commercial static source code analysis solutions are available, all are incapable of supporting multiple technologies and lack enterprise grade capabilities to support wide scale use across large organizations. 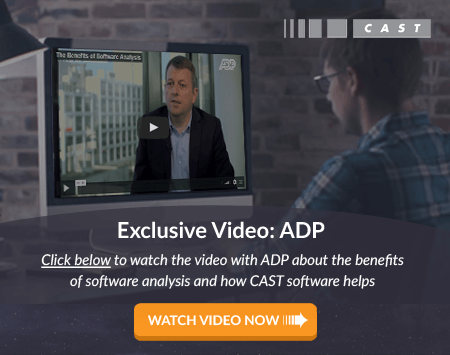 CAST AIP (Application Intelligence Platform) is an enterprise-class solution designed to meet the needs of organizations working within a complex, multi-tier infrastructure consisting of multiple technologies. It is the only automated static source code analysis software with these capabilities. AIP supplies an accurate, objective benchmarking measurement that your organization can utilize to consistently monitor improvement efforts as they are implemented. If poor software quality, undetected defects, or overly complex applications are causing significant infrastructure problems, AIP offers a dependable assessment solution for improving development practices and software quality. Take a look at the insight automated static code analysis tools can generate today!